Anderson and Krathwohl developed a matrix for combining cognitive processes and knowledge dimensions that can be adapted when planning courses and lessons. As faculty, we can adapt this matrix in our own lesson planning. Here’s an example from a 300-level applied linguistics course that I teach in the Department of International Languages and Cultures. Learning Goal: Students can accurately define individual differences and list examples. Assessment: Students take a low-stakes quiz in which they define individual differences and provide examples they recall from the reading and group work activity. Students read section on individual differences in How Languages are Learned respond to reading prompts before class. In class, students work in groups to identify individual differences in written profiles of learners and present their findings. Instructor provides learning experiences so that students practice recalling definitions of terms and characteristics and elements of the theory. Students participate in learning experiences that guide them to start explaining principles and models of the social cultural perspective. It’s important to note that at this level, the students are not just restating an author’s or instructor’s explanation; that would be remembering. Rather, they are using concepts, terms, and paraphrasing to explain the concept or theory. 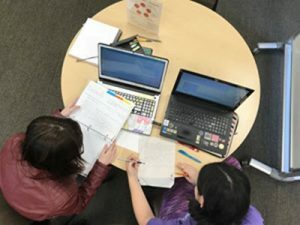 Eventually, students point out passages in a research text that indicate the linguistics researcher is writing from the social cultural perspective of second language learning. They are using their knowledge of the theory as an analytical tool. Finally, the instructor can work with students to develop and apply motivational and language learning strategies that are based on a social cultural perspective of second language learning. The above processes can also be reorganized into a class lesson planning tool. The combination of Bloom’s Taxonomy and knowledge dimensions create a powerful approach for your faculty toolbox in support of our efforts to provide the excellent undergraduate education opportunities to our students. For more about deploying Bloom’s Taxonomy and the four dimensions of knowledge, check out Laurie Richlin’s Blueprint for Learning: Construction College Courses to Facilitate, Assess, and Document Learning (2006), one of the sources of today’s TLC blog entry. If you would like to explore in more detail using dimensions and Bloom’s Taxonomy verbs in a lesson planning form, download this MS Word version. Jeffrey White directs the Learning Commons in the Shepard Academic Resource Center in Buckley Center 163, where he trains tutors to reach Level 1 of the International Tutor Training Program Certification. He also teaches German, an applied linguistics course, and a preparation course for study abroad in the Department of International Languages and Cultures. Jeffrey is currently the president-elect of the Northwest College Reading and Learning Association. He is happy to meet over coffee or lunch to discuss course and lesson design, training, and teaching in higher education and can be reached at white@up.edu.